Specifically designed for opulent weddings and celebrations, Metropol Banquet was opened in 2012 and is one of Los Angeles’ newest wedding venues. It includes two modern banquet venue spaces in the heart of Glendale, both of which have separate entrances for privacy and exclusivity on your wedding day. 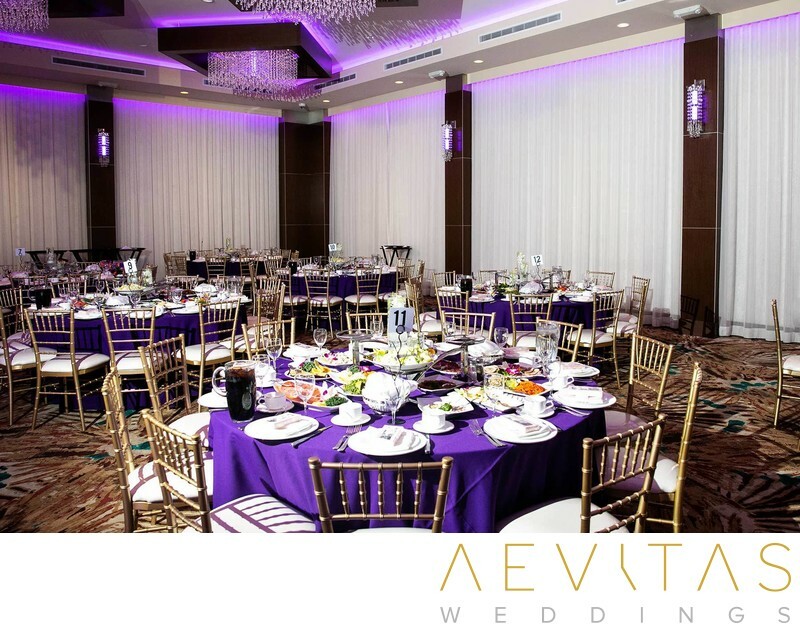 These lavish ballrooms feature state-of-the-art LED lighting, sound and projection screens, coupled with contemporary decor and entertainment stages for you to create your dream wedding. The Modern Ballroom reflects a more contemporary design while the Millennium Ballroom features a classically-styled elegance. The Modern Ballroom has the capacity for up to 400 guests and is entered through a stylish foyer which is ideal for cocktail hour drinks and hors d’oeuvres. Let your guests be amazed as they step into its opulent 5,550 square foot interior, with an illuminating dance floor which is bound to have everyone out of their chairs. LED lighting chandeliers are programmed by computer to transform the colors and patterns throughout your event, creating the ambiance you desire, while a glass staircase leads from the ballroom up to the bridal lounge where you can get ready with your entourage. The Millennium Ballroom has the capacity for up to 300 guests, with elegant crystal chandeliers, wooden drop frames and romantic drapery. A marble white foyer leads into this 3,500 square foot space, illuminated by white LED chandeliers and with an entertainment stage that provides space for live bands or cultural performances. The Metropol Banquet can assist with all aspects of your wedding day planning, from providing catering recommendations to DJs, florist and cake designers. Their helpful staff are highly experienced in executing large-scale banquets and wedding events, with acute attention to detail. For couples planning large-scale wedding events and multicultural celebrations, the Metropol Banquet is equipped with the facilities and amenities to make it happen. Coupled with gorgeous interiors that can be styled to your choosing, it’s hard to find a more modern Los Angeles wedding venue.